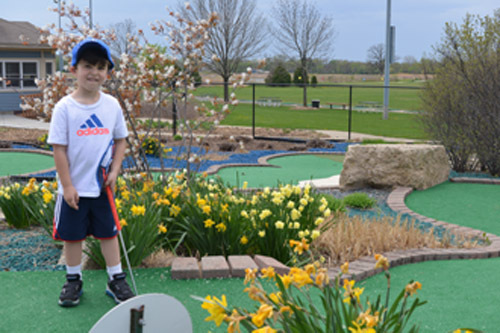 Operated by the Crystal Lake Park District, Lippold Family Golf Center includes 40 lighted tee areas, a 60,000 square foot putting green, sand traps, a pitching green, a fairway practice bunker, two 18-hole miniature golf courses, a clubhouse, party room and concessions. Golfers of all ages and abilities consider it the perfect location to improve all aspects of their game, including a dedicated short game area. Services offered include group classes and individual lessons offered seven days per week and special demo days. A restored wetland and wildlife area with walking and biking trails uniquely surrounds the entire facility. Final Mini Golf Group will be allowed to go out no later than 45 minutes prior to closing. Published closing times are weather permitting and subject to change. April 5 Update: Miniature Golf only on opening weekend. Due to conditions on the field, the driving range will not open on April 6. Conditions will be reevaluated on April 8. The greens of the two miniature golf courses at the Lippold Park Family Golf Center welcomed golf enthusiasts for the very first time in July 2003. Harris Miniature Golf of New Jersey, the premier miniature golf course builder in the United States, built the courses. 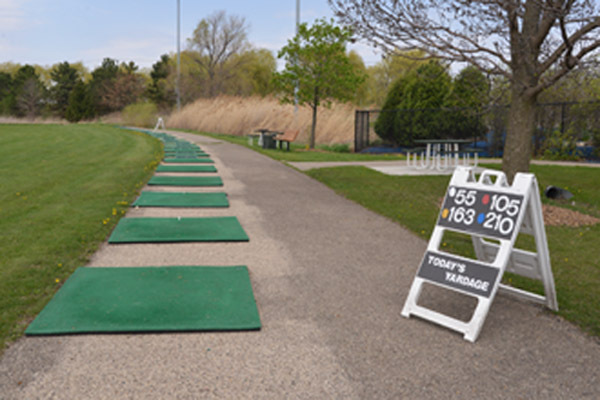 The addition of the two 18-hole miniature golf courses to the existing driving range is part of the Crystal Lake Park District Master Plan, published in 1999. One course, Sports-N-Courts is handicapped accessible, has a sports theme and is a par 40 course. The second course Tees-N-Trees, is a par 41 course and has a prairie theme. This membership entitles golfers to unlimited range balls at our facility for the entire season April-September. All parties require adult supervision. Parties are held on either of the two mini-golf courses. In the event of bad weather, the party will move inside. Outside decorations are welcome, but no outside food or drink (other than cake) is allowed. Reservations are required. For more information, and to reserve your date, please contact us at 815. 477.5401. Miniature Golf Parties may be booked May-September.